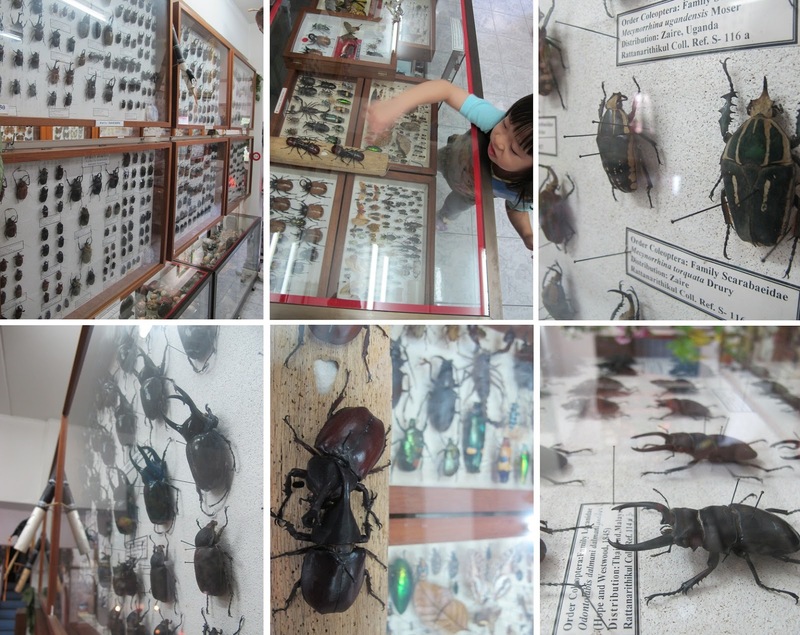 On Christmas day, we decided to pay a visit to a little known museum I stumbled upon online. Even the hotel reception and taxi drivers I spoke to had not heard of it. The reception counter had difficulty finding the street indicated in the address on the tourist map at first, due to variations in translation from the traditional Thai into its English version. Looking back, I do not recall any tourist publicity such as pamphlets or information boards about this place at all. I was starting to wonder if this was worth a visit. Driven purely by my love for natural history, and a desire to share the beauty of God's creation with my kids, I decided to go ahead and plan a visit there. After a hearty breakfast at the hotel, we summoned a Tuktuk to take us to Nimmanhemin Road, about 2 kilometres west of the moated square. We took some time to find it, and finally spotted a three storey building decorated with giant mosquito sculptures all over its front gate. 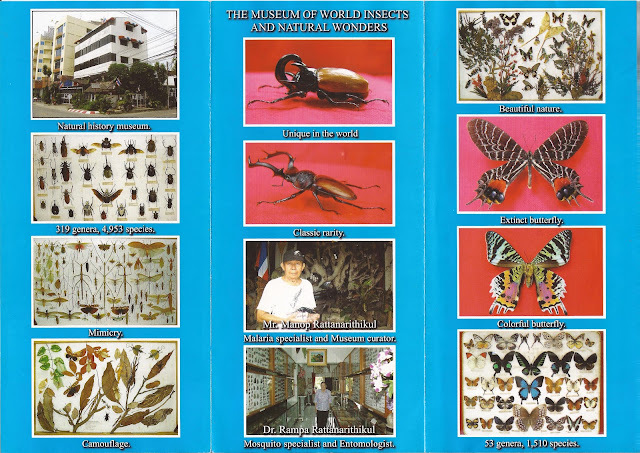 The building resembled any other office building surrounding it, but a closer look revealed large insect motifs all over the exterior walls. We rang the doorbell and someone unlocked the small gate to allow us in. We found ourselves in what appeared to be a house garage and driveway. We found out that this museum was indeed the residence of the owners Dr. Rampa and her husband Mr. Manop. Dr. Rampa is a semi-retired mosquito specialist and entomologist (one who specialises in insect scientific studies) and Mr. Manop is a retired malaria specialist. Their daughter mooted the idea of turning their residence into a 'home museum' to display and celebrate their lifetime of work dedicated to their respective fields, and they have become the museum's curators since. Before we entered the house, we marvelled at a rare display of vintage sports cars parked in the garage and took some photographs with them. A narrow pebbled pathway took us through the sliding doors of their house and into their modified living room. We were greeted by a simple registration counter and given some pamphlets describing the exhibits in different rooms and floors. The biggest honour was to have Dr. Rampa herself be our personal tour guide! We found out that it was usually her daughter who would do the guiding as the seniors were rarely available. However on this special occassion, Dr. Rampa was at home and gladly welcomed us. Her enthusiasm rubbed off immediately, and we knew we were in for a special treat. 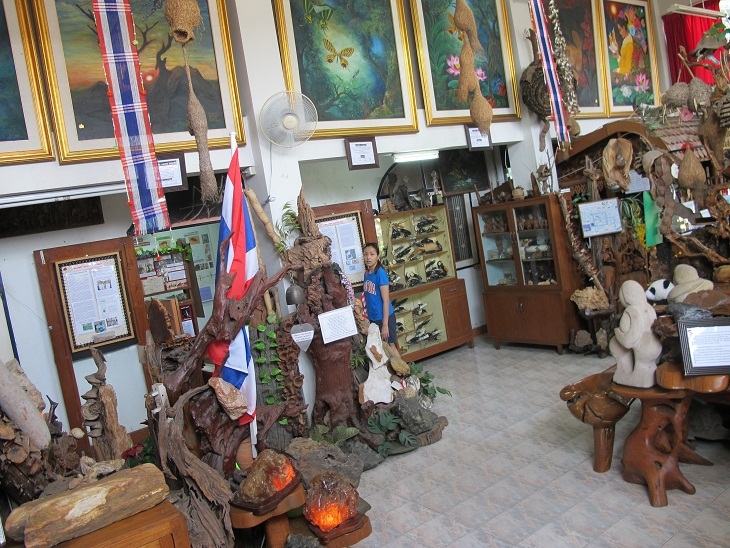 Without much time to marvel as the large exhibits in the 'living room' (more about that later), we were quickly ushered into a small room adjacent to the main hall where Dr Rampa briefed us on the history of the museum, and her lifetime of work into the mosquito species of the world. She showed us memorabilia such as her research posters, early notebooks, first collections, and photographs of people she had collaborated with over the years. A display cabinet depicting the early years of Dr. Rampa and Mr. Manop's career interests in the field of mosquito studies. Dr. Rampa's first note book from 1950 is on display here. Dr. Rampa describes to us here research interest. On the walls are photographs of people she has worked with in the past, conferences and workshops she has participated in, and some research posters. On the study bench is an optical microscope and under the table, some netted boxes for holding live specimens! 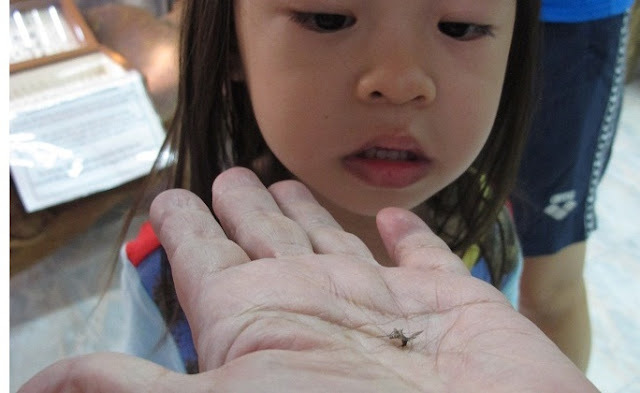 Just then, a mosquito flew by and with a single swat, the professor handed us the dead insect in her palm. She identified the species, and then told us to wait while she excused herself. A few minutes later, she returned with a square inch of cardboard, wrapped it with a small piece of tissue paper, and attached a similar sized clear plastic card over it with a stapler. Pressing the newly collected specimen between the board and the plastic, she passed it to the children and explained to us how we can encourage our girls to start collecting specimens from a young age. Her materials were simple and effective, and I was impressed with her genuine desire to pass on her interests not only to the 'experts', but to the next generation as well. "Here you go..." The expert shows us how it's done! We had some moments following that to soak up the main ground floor exhibits on our own as Dr. Rampa left us to attend to some matters. 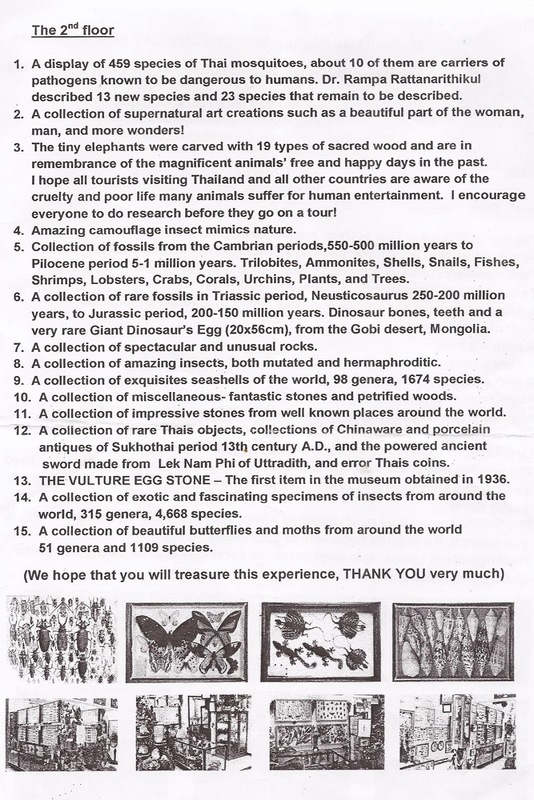 With the help of our trust 'exhibit description' pamphlet given to us earlier, we were able to identify many of the natural treasures clustered and hung all over the room. I must admit that to the eye of a lay-person like myself, some of the exhibits resembled more to me like driftwood or rocks than anything extraordinary. A treasure hall dwarfs the intrigued pilgrim. Dr. Rampa explains the signficance of the items in this corner. 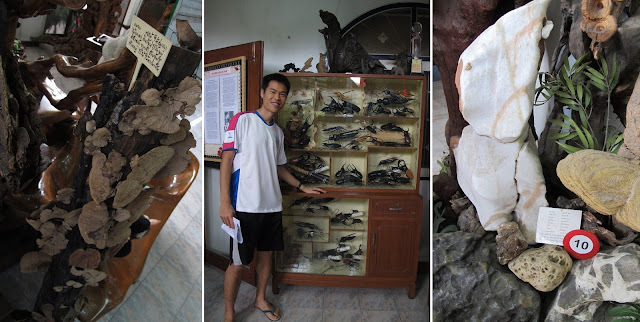 Left to right: petrified fungi; a cabinet full of giant insect replicas; artistic rock forms from river erosion. 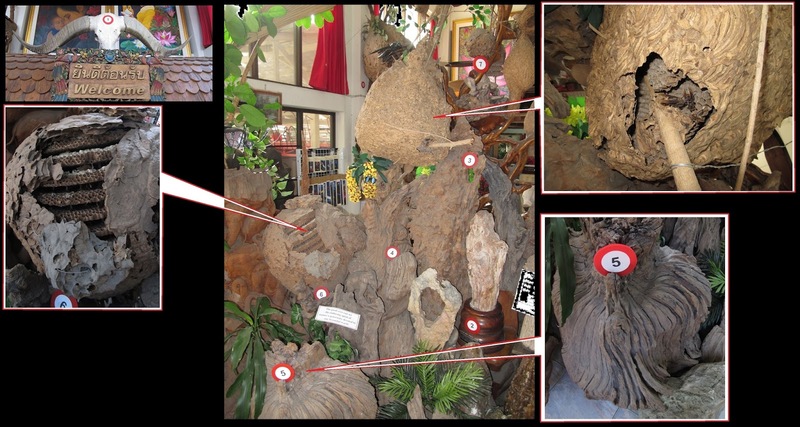 Left to right: display of mosquito specimens; descriptions of some of the larger forest critters; another perspective of the main hall showing a large wasp nest hanging over the welcome counter and cabinets containing wood carvings. 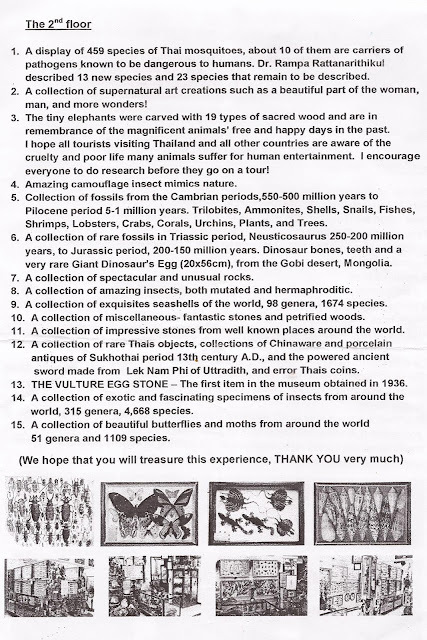 You can read about the significance of item number 13 "The Vulture Egg Stone" on their website (link provided below). A panoramic view of the second floor. The "Beetles" section: have you seen more beetles in your life? Soaking up the second floor! My favourite display: the "Seashells & Marine Life" section. 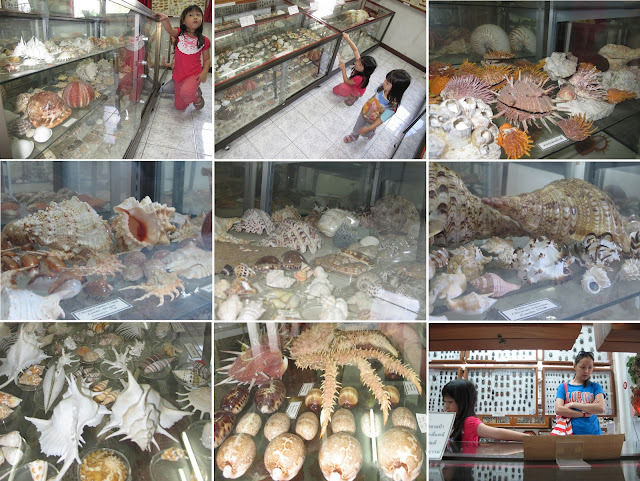 Notice the large spider crab, which Dr. Rampa bought from the local market and curated all by herself. The kids had the opportunity to take their time to browse and explore, making more than one trip up and down the stairs to look and re-look at some of the exhibits. They were most interested in the fossils and dinosaur egg specimens. Their questions centered around the themes of 'baby dinosaurs', and their curiosity was aroused by the mystery and majesty of these creatures that we unfortunately know only from the fossilized remains they leave behind. Perhaps Singapore's decision to bring in dinosaur specimens of their own aren't too bad an idea after all, especially if it will inspire generations to notice and become interested in the natural history of our own little red dot, Singapore. Examining the fossils from the Cambrian periods (550-500 million years old). Discussing the fossilized dinosaur eggs from the Triassic period (250-200 million years old). The third floor houses even more collections but they is closed to the public at the moment. The hosts also have their own living areas on that floor. It was an amazing morning, and by the time we were ready to leave, we realised that we had spent the entire morning in this small corner of Chiangmai. Needless to say, it was a small corner filled with some of the most valuable treasures in the city, and we hope that we have inspired you to pay this corner a visit the next time you pass by the moated city. Dear Scott, thank you for your compliments. I presume you are referring to the paintings hanging on the walls of the museum? I am unsure of their origin, but likely belong to the collection of the museum curators.